How do I know if my child has an articulation disorder? It’s not unusual for young children to mispronounce words. Often, they will substitute a “w” for an “r,” such as saying “wunning” instead of “running.” This is considered a normal part of language development until your child reaches a certain age. However, past this milestone, intervention is needed to prevent long-term speech, pronunciation problems, spelling disparities, and even trouble reading. Can adults have articulation disorders? Yes. Often these disorders stem from pronunciation problems they had in childhood. Brain injuries or illnesses may also cause these problems. There is a distinct difference between an articulation disorder and an accent. A regional or international dialect is not a speech disorder. However, Therapy Works will provide accent modification services for those who wish to modify their accents. How are articulation disorders treated? We work closely with each patient. First, completing a thorough evaluation and next tailoring a treatment plan that focuses on his or her goals. We will examine vowel and consonant sounds in all positions of words. 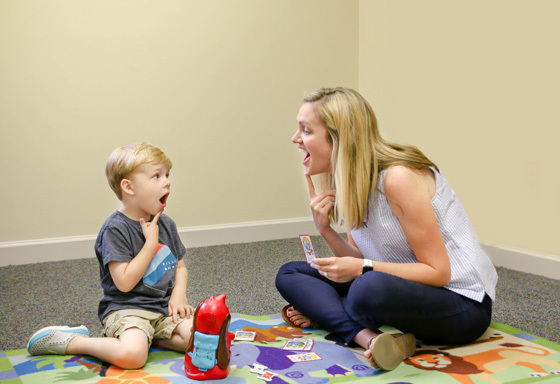 In therapy, we work one-on-one to establish correct pronunciation of sounds in individual words, phrases, sentences and in conversation. Do you have questions? We love what we do and we would love to talk to you about how we can help you or your child develop the confident skills needed to succeed academically and professionally. We’ve provided a useful sound development chart to help you evaluate your child’s progress.